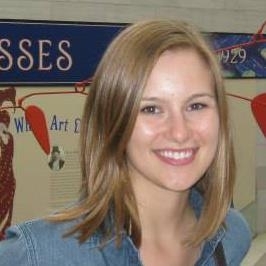 Kelsey Kleine, alumna of the Montessori School of BG and graduate of Ohio Northern University, is our new art teacher. She holds a bachelor's degree in Studio Arts and a minor in Spanish. She has experience working at art-a-site and Arts by the the Bay, two gallery/studio businesses. She has also worked with the Hartford County Cultural Arts Board and has other philanthropic experiences with arts, children, and leadership. Kelsey states, "None of my experiences would have been as likely without my Montessori education. Like Maria Montessori, I believe that a child's learning environment is as important as the learning itself. As you know, MSBG offers a unique environment which fosters a life-long love of learning. This love of life-long learning has led me to stubbornly hold on to interests--whether they fit into what society was telling me I should find fascinating or not. 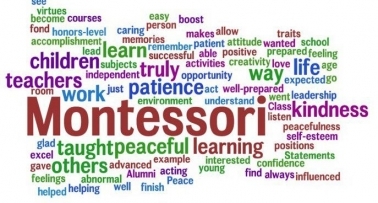 Self-exploration and discovery were two of Montessori’s valued topics in the development of a child’s self awareness. I truly believe that art education can not only expose students of all ages to a way to interpret the world around them, but is also a way for students to grow their understanding of other information they are learning whether as an individual or as a class. I believe that MSBG’s setting allows students to find what works for them and get excited about something that inspires them to delve deeper than the standardized level or topic. Maria Montessori also believed in the beauty found in nature and that creativity is a reflection of the natural world. This creativity can turn into creative problem solving. To me, art and creativity provide ways to associate information in a visual, tangible way. Personally, I have always been one of the many students who need visual and kinesthetic elements in education to best understand material. Some children find themselves delving into the wonderful worlds of math, science, or literature. Others find art. Every student deserves a quality art education. Not only because of the wonderful world of art and art history itself, but also because children by nature love to touch things, feel things and learn how things relate to one another. And, I truly believe art can help students to connect dots when their learning style benefits from that extra resource. I am honored to have the opportunity to help students to find further ways to explore the world of the arts integrating group projects, installations to add color to campus, and pieces that reflect on and supplement what they are learning in their main classroom (both skill-based and topic-based) and to continue to foster that love of learning that I found rooted in my Montessori education as a young child." The Mustangs cross country team competed in the Lakota Invitational this past Saturday in Bettsville. This event has continued to grow since our team first joined in 2004. We were split into two groups, but awards were separated by gender. 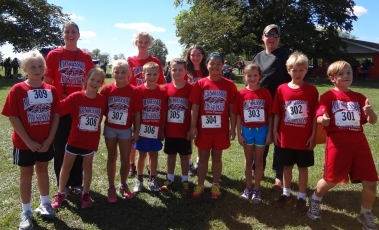 K-3 boys and girls ran 1/2 mile and the 4-6 boys and girls ran 1 mile. In the K-3 girls group, Hannah Castor led our team and finished 7th overall out of 66 girls, in a time of 3:18. Hannah received a medal. Following close behind was Katie Oestreich. Katie finished 22nd overall in a time of 3:34. Our next finisher was Jeanette Fretter in a time of 5:05. In the K-3 boys group, Jackson Krueger finished 9th overall out of 74 boys, in a time of 3:09. Jackson received a medal. Finishing next for the Mustangs, in 22nd place, was Joey Hover in a time of 3:28. In the 4-6 girls group there were 58 runners. Maddie Cleland led the Mustang pack and finished in a time of 9:06. Right behind Maddie was Lily Martin-Williams in a time of 9:33. In the 4-6 boys group there were 74 runners. Leading for the Mustangs was J.J. Poiry. J.J. finished 34th overall, in a time of 7:29 and Justin Espen finished in a time of 8:29. Alexa Whyte ran 2 miles in the Middle School race at the Lakota Invitational. Alexa finished in 128 place out of 171 girls. She finished in a time of 17:17. 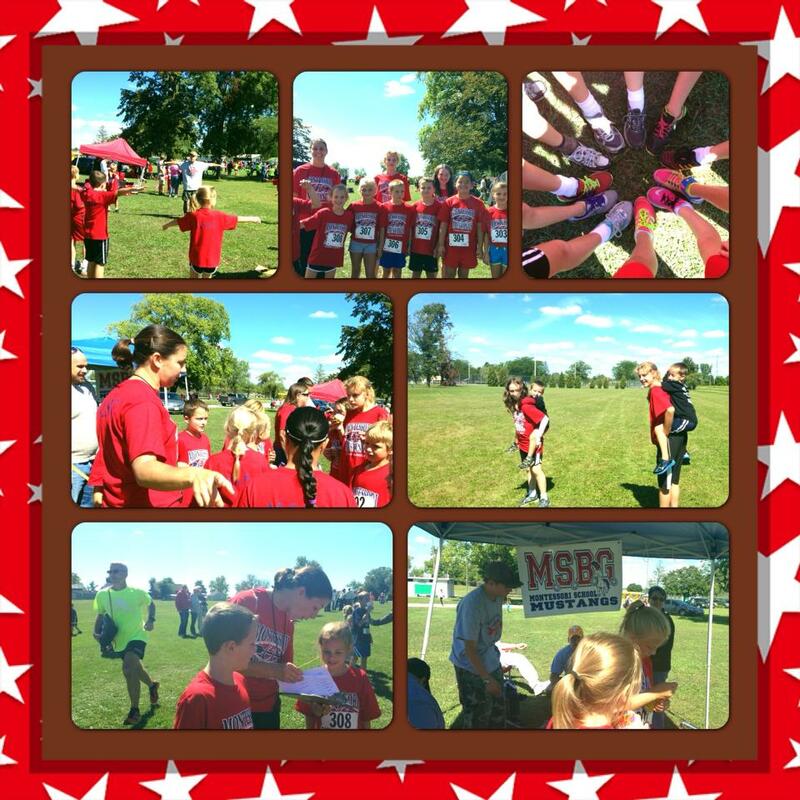 Thank you to everyone who made our home Cross Country race a huge success yesterday! Spirit Wear Sale in ON! MSBG Spirit Wear is now available for you to order. orders are due 10/2/13. 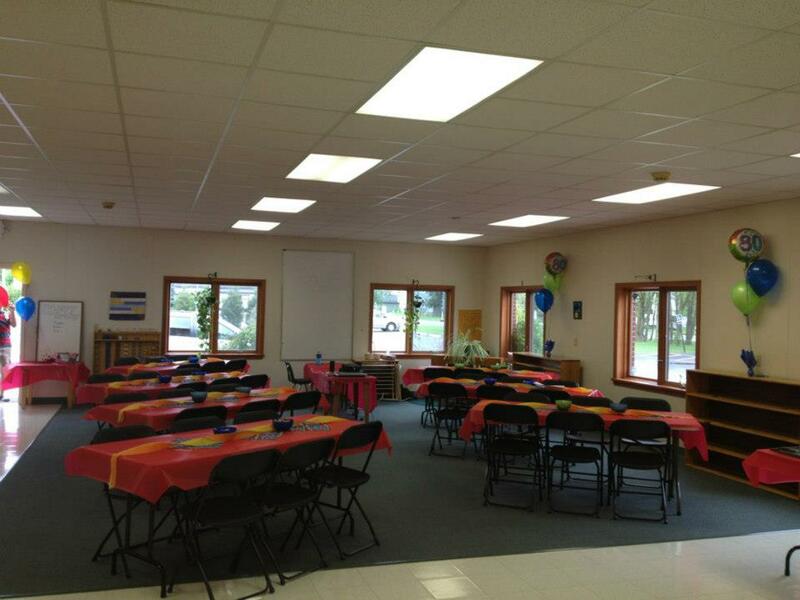 The 3-5 year old class started this week and the 6+ class begins September 26. Click HERE to register! Spots are limited! Register today! 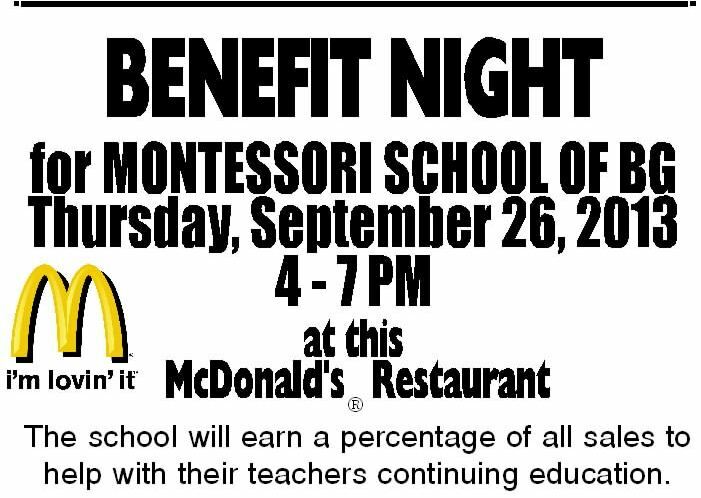 This FUN event is a great way to socialize with our school community as well as support our general operating fund. Tickets are on sale. Click HERE to purchase or visit the school office. Do you have any gently-used fabric placemats at home that you don't need/want anymore? Lower elementary would like them. The children use the placemats at lunchtime for cleanliness and grace & courtesy etiquette. The Studio Connection has wonderful musical opportunities for children. Click HERE for the flyer. 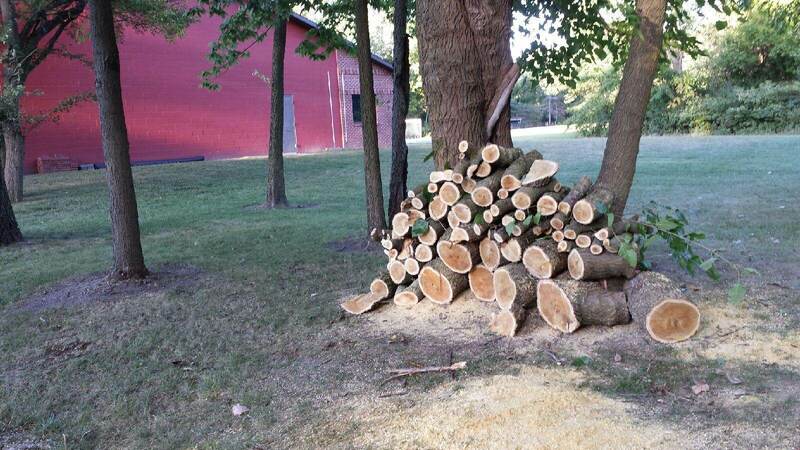 BG Parks and Recreation has a variety of activities for all ages. Go to bgohio.org for more information. One of our families is selling their BG house by owner. Click HERE for more information. Those striving for peace in our world. Miss Stephanee as she continues to recover. 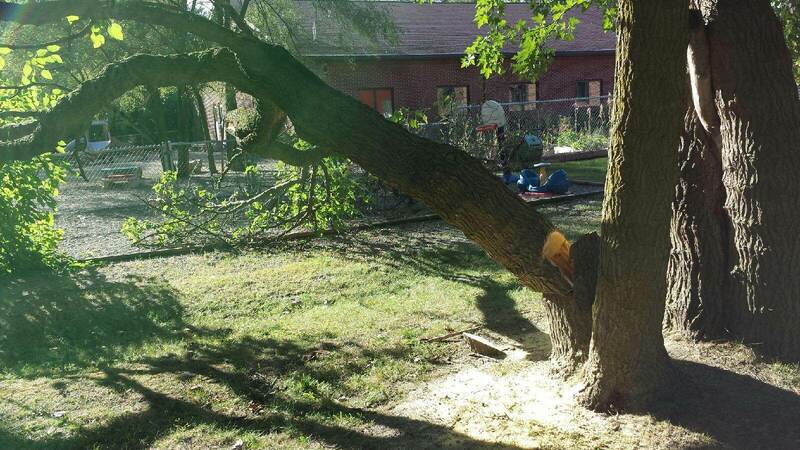 THANK YOU to Judge Mark Reddin for removing the dangerous fallen tree limb near the playground areas. A new parent talk session will be coming this fall: October 3-November 7! This six-week session is invaluable parent information and education. Approximately 70 people have graduated from this course and ALL highly recommend it. Spots are limited to 16 people so mark your calendars today! When your child comes home throughout the school year, there will be lots of information you want from him or her. Here are some important things to keep in mind when you’re talking to your child about school. The way you ask the questions matters. If you give your child the opportunity to answer with one word (yes, no, a name), then you’re likely to get a one-word response. Try to ask open-ended questions to keep a conversation going. Often kids are not specific, so you have to ask for specific information when you want it. Starting with factual questions is a great way to ease into conversation. Avoiding emotion-packed words (fun, happy, sad, mean) will allow the conversation to go on longer. Asking positive questions will give your child a chance to express concerns. Negative questions will stop a conversation. 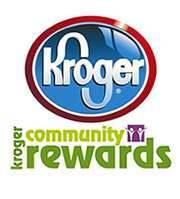 Copyright © 2013 Montessori School of Bowling Green, All rights reserved.